An R - 2 choir rehearses during lunchtimes each week. It is open to all R -2 students, with opportunities to perform at school events and assemblies. A year 3/4 choir is run in Terms 3 & 4. It is inclusive and open to all Mainstream students. The Choir extends students vocal skills, and incorporates a range of musical genres with opportunities to perform at school events and assemblies. 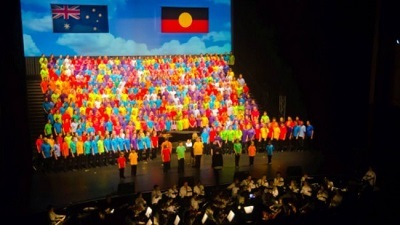 This choir runs from Term 1 - end of Term 3, where it culminates in a large performance at the Adelaide Festival Theatre involving around 140 schools across the state. Students learn songs from a selected, varied repertoire with advanced choral skills. The choir also performs at school events as part of their practice throughout the year. A percussion group is run which is open to all Mainstream students in the Upper Primary school. Students of all abilities are able to participate in this group learning songs with multiple parts including, rhythm section, melody and harmony. Students get to use a range of instruments such as Xylophone, Steel Drum, Joia Tubes, and Synthesizer. Trinity Gardens School offers instrumental tuition from private providers offering instrumental tuition on-site in piano, violin, saxophone, clarinet and guitar. Please see the School Office staff to access the tuition information.